That is how Wikipedia defines “Business Networking.” The definition is almost as daunting as standing in the middle of a room full of people you don’t know. If you’re a naturally introverted person like myself, the thought of approaching stranger after stranger to introduce yourself and your product or service is enough to make you want to run and hide. Without any experience or proper guidance, networking can be tough. The anxiety builds from not knowing what to say, when to show up, where to stand or, ridiculously enough, what to do with my hands. Should I put them in my pockets, on my hips, gesture wildly as I talk, fold my arms across my chest? Every one of those actions sends bad body language signals to the person I am speaking with. At least that’s what all of my “research” has told me before the event. This was me at my very first networking event. Scared, anxious and second guessing everything I said or did. Networking, however, is a necessary skill that all professionals must learn. 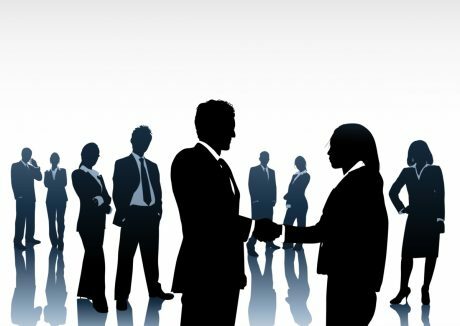 Whether you are running a business or developing your career, networking is essential to building and maintaining business relationships. Networking also builds self awareness by allowing you to develop a verbal presentation of your values and professional experiences. No matter what industry you’re in, networking is always a good idea for business professionals wishing to build and grow their influence. A strong and active business network has advantages that can make your business grow quicker than you ever thought was possible. With these tips you will be able to better navigate those sometimes uncomfortable waters more easily. 1) Show up early and be prepared to stay late. The first tip really should be to just relax, but showing up early will allow you to take a few deep breaths before things get too busy. It’s usually calmer and quieter at the beginning of the event so you have an opportunity to ease your way into things. People won’t have had a chance to form cliques yet so it should be easier to find conversation partners. As the saying goes “the early bird gets the worm,” so that extra 15-20 minutes can go a long way towards getting in front of the person you most need to speak with before he gets caught up in all of the hoopla. 2) Wear a name tag and bring plenty of business cards. Now you don’t want to be that person eagerly handing out your cards to everyone that walks through the door. You’re not promoting a band. However, you want to be sure you have enough for every connection you make. Someone may want multiple cards because they know others that could use your business or be able to help you further your business. As for the name tag, always wear it on the right hand side of your body. There will be a lot of hands to shake and eye contact will be more naturally directed to the side of the body where your hand is reaching out from. 3) Don’t be the fly on the wall. It can be tempting, especially for my fellow introverts, to linger around the edges of the room waiting for someone to approach you. Summon some courage and get in the game. “What brings you to this event?” is an easy conversation starter and gets them talking so you can do what we introverts do best, listen. Allow them to lead the conversation and provide responses that let them know you are present in the moment. When others join the group, introduce yourself and ask them the same question. If approaching an already formed group “May I join you?” is a great ice breaker. Nobody wants to be the person to say “no, go away.” Introduce yourself and allow the conversation to build around you. They will usually ask you a few introductory questions about what you do. This will help to draw you out of your shell. Remember to listen intently. Everyone you meet has the potential to help your business in a tremendous way. 4) Leave your sales pitch at home. Networking is about building relationships. People do business with people they know and like so keep it light and keep it real. Remember to be yourself and don’t try too hard to impress anyone. When asked about your product or service be prepared with an easy description and a few recent accomplishments. Most importantly, learn how you can help or connect them. 5) Networking is where the conversation begins. You will need to follow up. Ask how you can stay in touch and set up a follow up appointment. You may even be able to leave the event with two or three lunch meetings. Contact everyone you connected with no later than 24 hours after the event. You want them to know you haven’t forgotten about them. Maybe even reference something memorable you spoke about during your conversation to ensure they remember you. Linking with people who have business experience and building up your network with these people will certainly help your business grow and become more successful. Building a successful business takes a lot of time and drive, so it’s good to have a network of friends and associates to draw energy from and keep you going. By surrounding yourself with people who share a similar drive and ambition, you are more likely to move forward more quickly.